Today on the last day of 2014 I finished off another batch of World War II French. First up is another squad of infantry. And finally is a Panhard 178 armoured car. Next up on my paint table is a pair of French Somua S35's and a Char D-1. 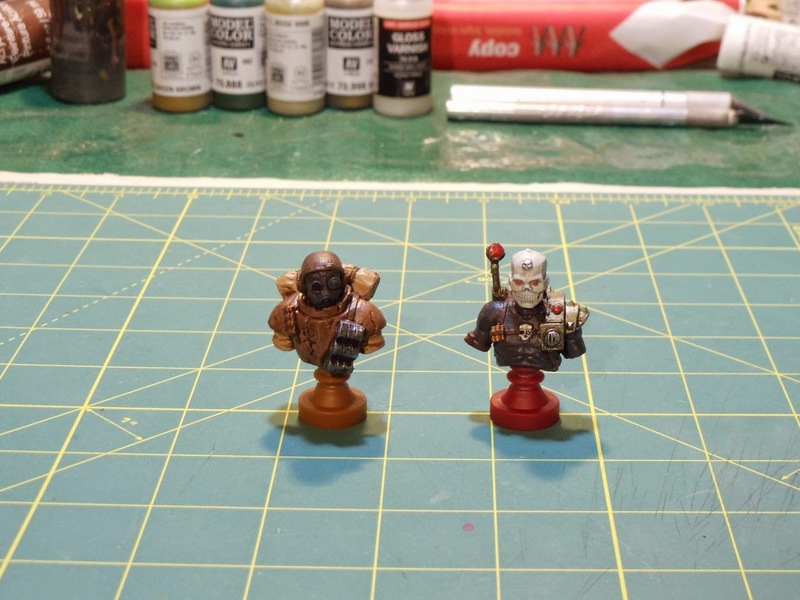 Then it will be onto my Martian Front figures. I've got 9 tripods primed and ready for paint and I'll need to assemble and paint 2 Slaver tripods, a bunch of drones, a Land Ironclad and maybe the Red Martian before MayDay. No problem. Looking back on my goals I had originally set at the end of 2013 I see I did mediocre at best. 2. 15mm Ancients - I got quite a number of Hittite bases completed. The army isn't quite finished yet, close but not quite. I kind of burned myself out painting them and the NK Egyptians. 3. 15mm terrain - I got a fair bit done. 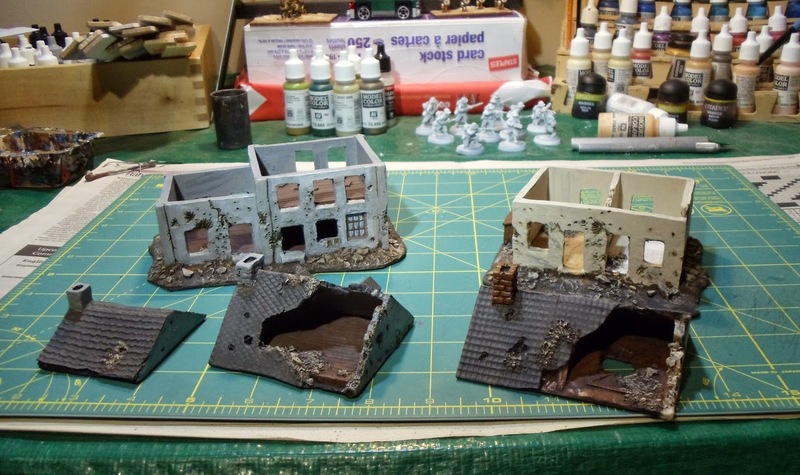 A handful of buildings were completed and I painted up the trenches for Terry and myself for the Martian Front. 4. 25mm sci-fi - did nothing and I'm not sure what I'm going to do with it. Maybe I'll get back into it sometime in 2015. If I haven't by the end of 2015 then I might as well get rid of it all. 5. 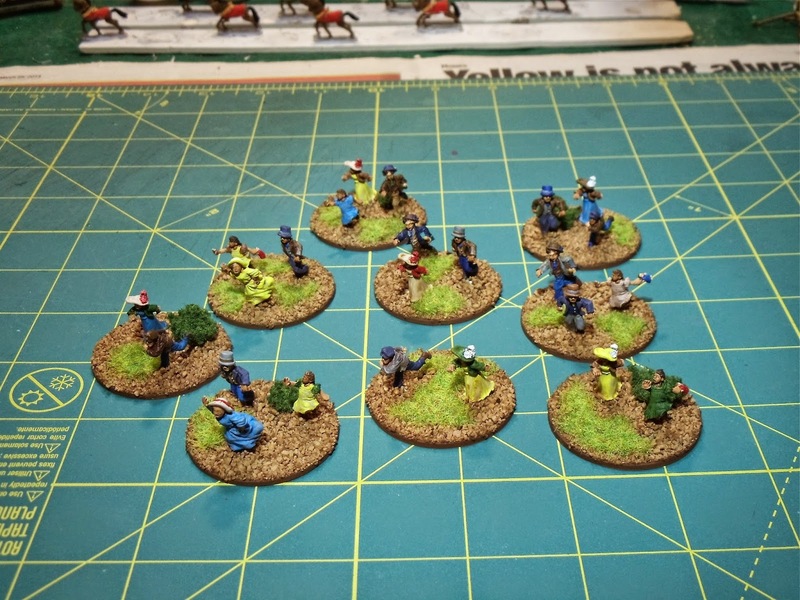 28mm Samurai - I didn't do any this year. 6. 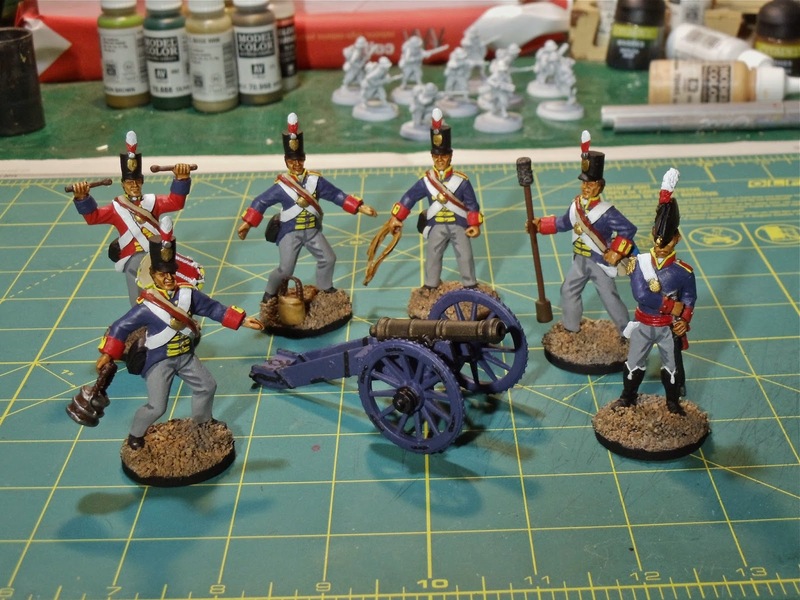 54mm War of 1812 - I got a TON of these done this year. I've got some more primed ready to go. 7. Martian Front - I didn't get quite as much painted this year as everything hasn't come yet. 1. War Rocket - paint the Valkeeri. 2. 15mm Ancients - finish off my Hittites. I'll probably hold off for at least 6 months to build interest back up. 3. Terrain - I've got a few more 15mm buildings to paint up. I've also got 11 28mm European buildings from Sarissa Precision to paint up for World War II. 4. 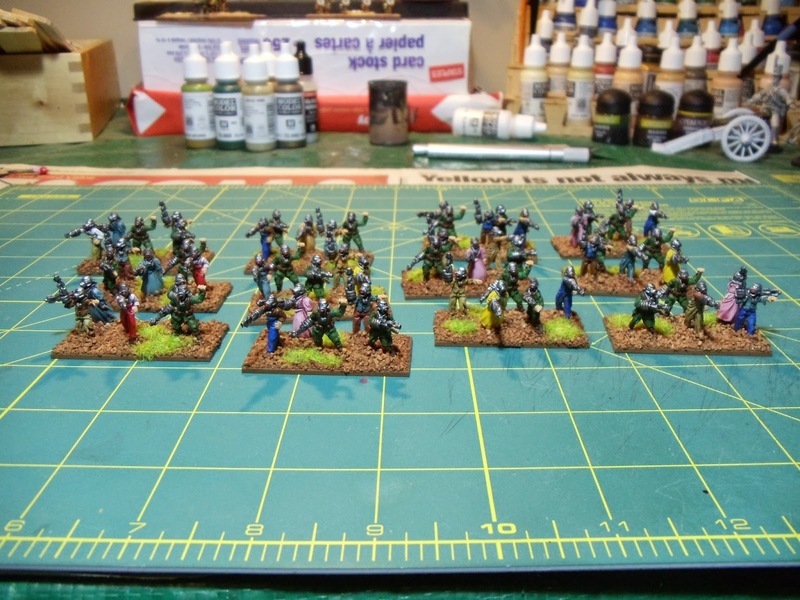 28mm Samurai - I've got to get going on this so I'll set the same goal I had last year: at least 4 bases done. 5. 54mm War of 1812 - finish off everything I have. I've probably got at least half a dozen units left to do. 6. Martian Front - as Terry and I are running a game at MayDay I've got a bunch of painting to do and I'll be getting to it as soon as I'm done my French. 7. 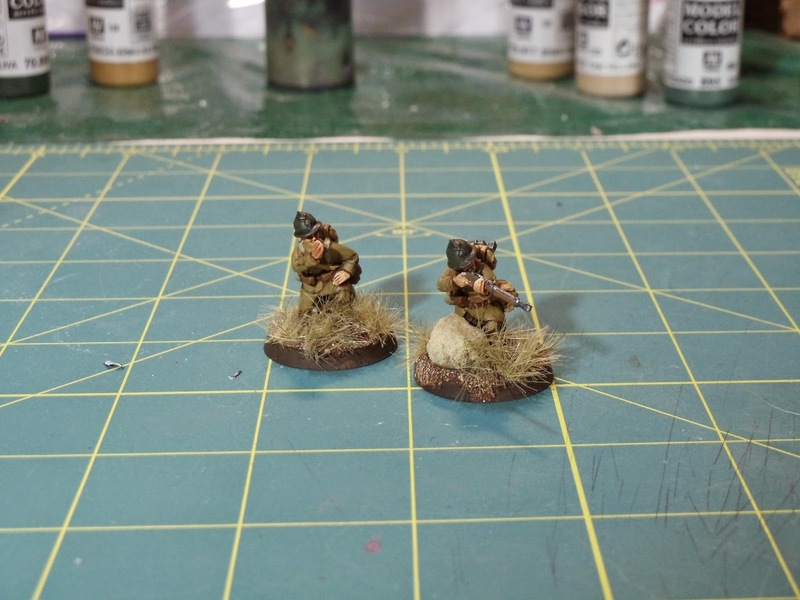 28mm World War II - finish my French (at least what I have). Warlord is going to be releasing more French so I imagine I'l be ordering more. And like a crackhead, I've actually ordered some Germans so they should arrive in a few weeks. This year was crazy for boardgames. In 2013 I played 96 matches of 29 different games. This year I played 144 matches of 36 different games. Probably the main reason behind the big jump is a good friend moved to within a couple blocks of me so we've been getting in a lot of games. My game collection this year grew quite substantially this year. I really hope to get in more plays of my wargames as I only got in about 25 games this year. The ones I really want to get more plays or any plays in are Eclipse, Conflict of Heroes, Friedrich and Sekigahara. So I'll bid farewell to 2014 and I look forward to much gaming in 2015. Have a safe New Year! 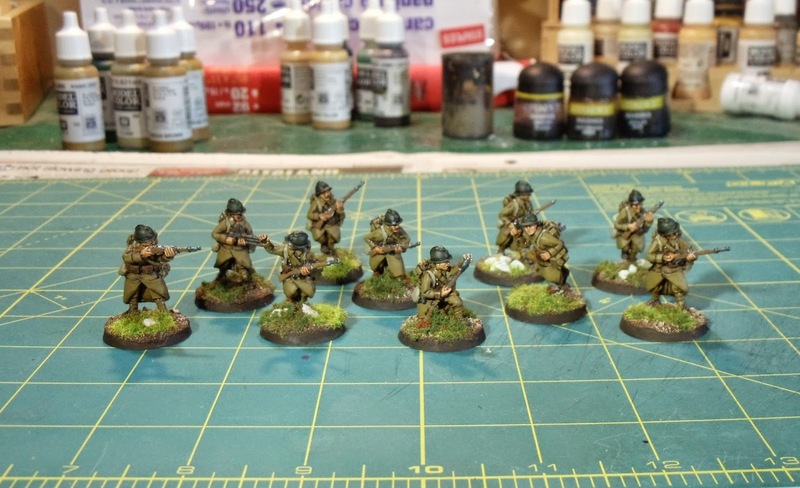 The past couple days has seen me finish off another batch of World War 2 French. All figures are from Warlord Games. First up is a Char B1 bis tank. And the next group of pics is a machine-gun team, a light machine-gun team, a sniper team and finally a forward observer. 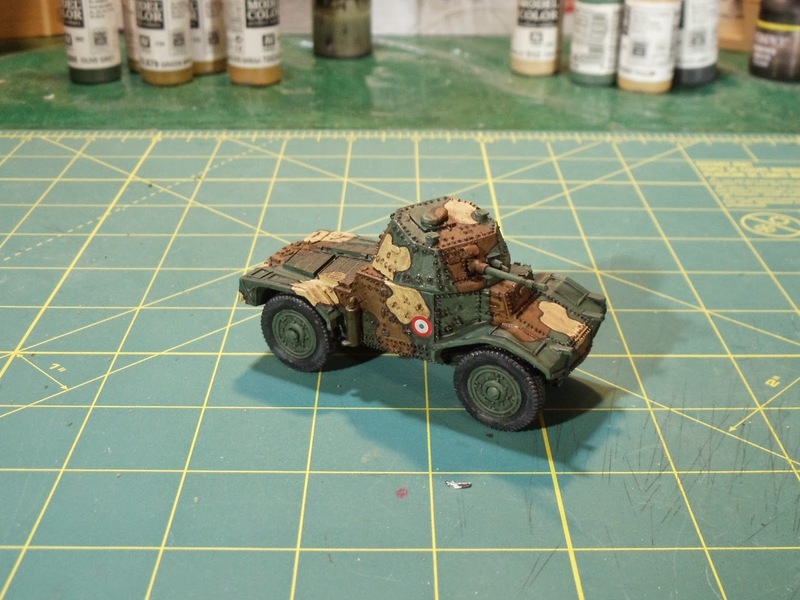 Next up on my paint table is another squad of infantry and a Panhard armoured car. 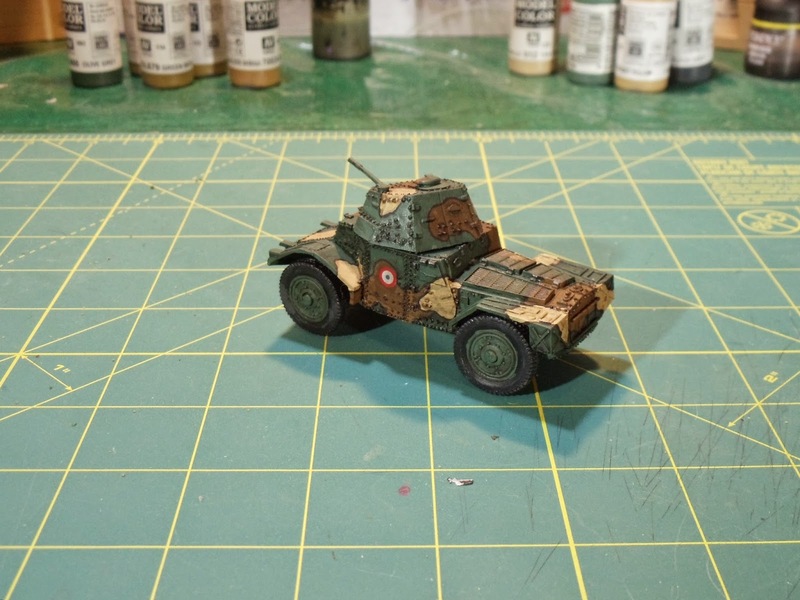 Today I finished up this little French Renault R35 light tank. 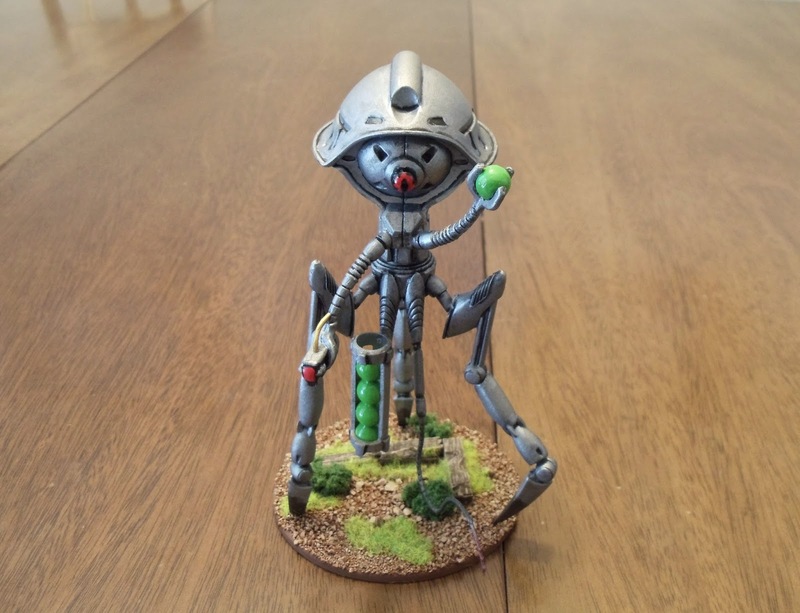 This model is from Warlord Games. This was a fun little model to do up. I'm going to put some roundels on, once the transfer sheet arrives (hopefully next week). 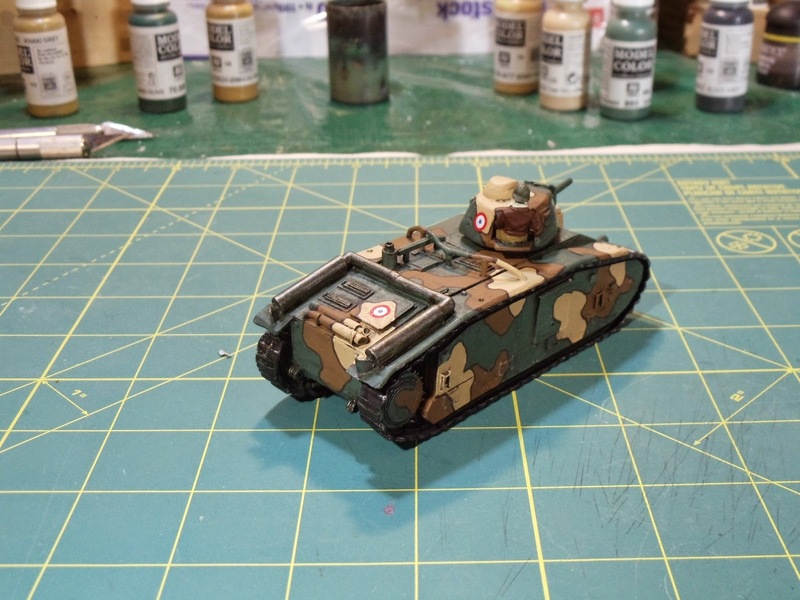 This is the last of the French that I have and I'm expecting another large package from Warlord hopefully next week with some more infantry and a bunch of vehicles. This should round out my French forces. 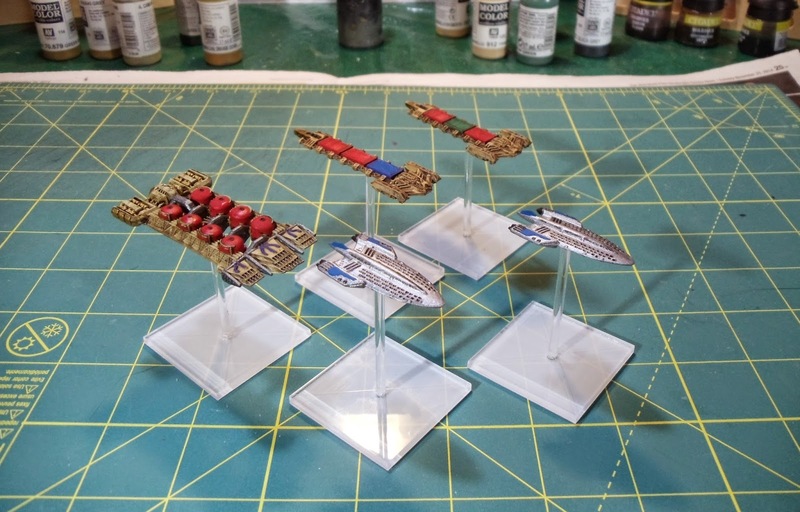 And finally yesterday I finished up this set of 5 ships for a good friend of mine. These ships are from a pack of civilian ships from Spartan Games' Firestorm Armada line. Next up… I'm not sure. I've got some 28mm modern US special forces sitting on my desk or maybe some buildings. We'll see. 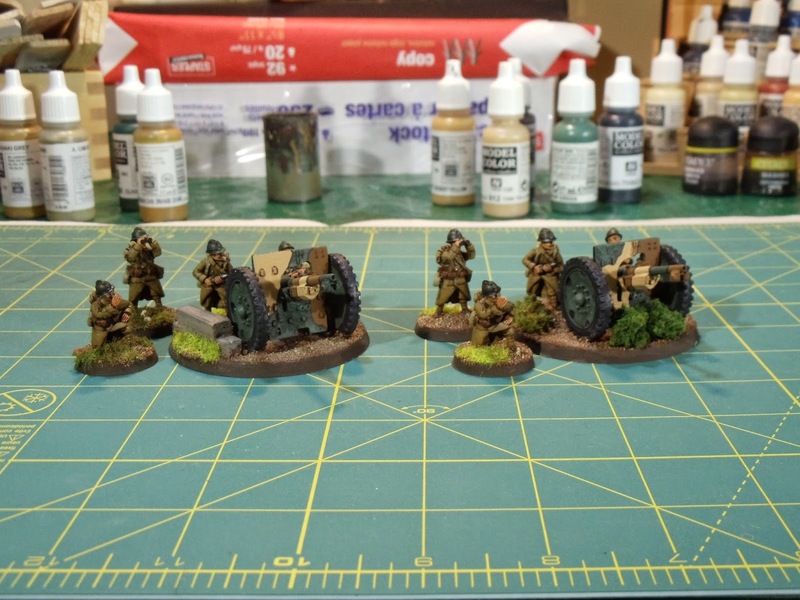 Last night I finished off a pair of French 75mm Model 1897 field guns. 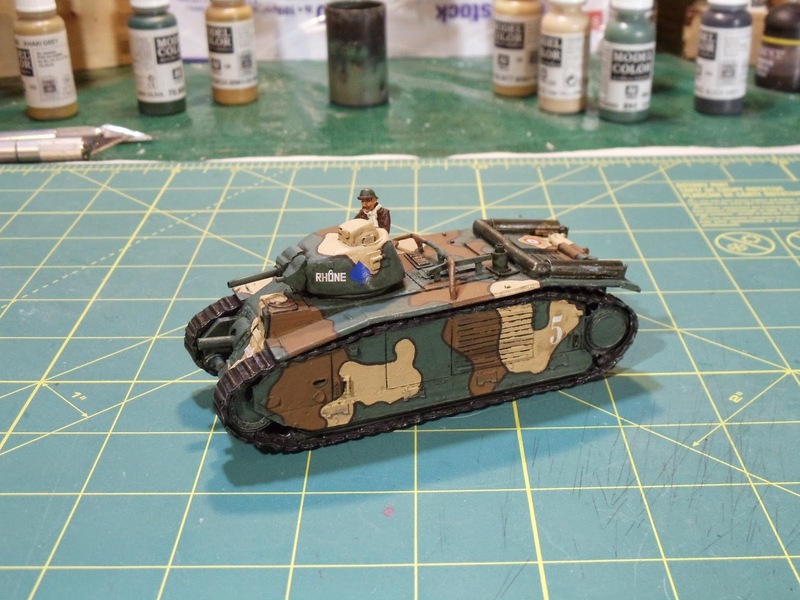 This was the first time I've ever actually painted any sort of camouflage and I think it turned out decently. Figures are from Warlord Games. 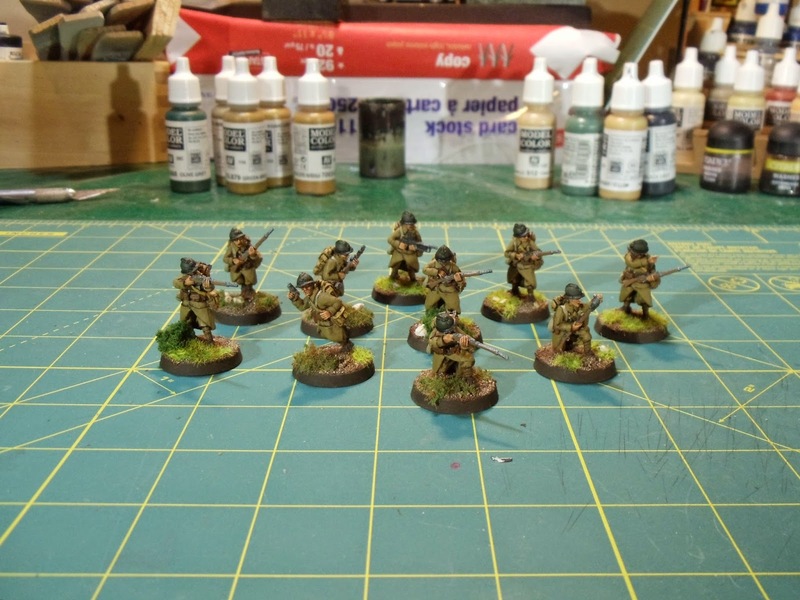 I also finished up another squad of infantry. Figures are also from Warlord Games. 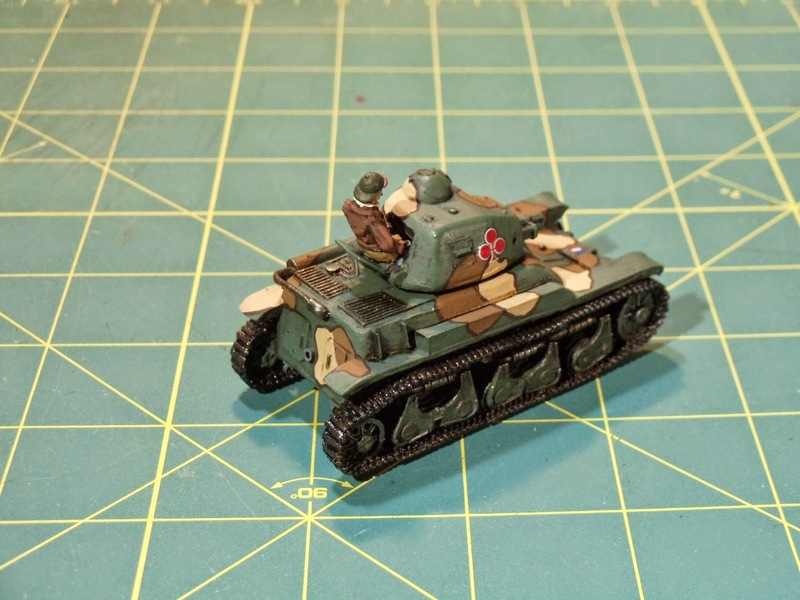 Up next is an R35 light tank. I've also got some infantry I picked up for Warfighter and my order of buildings from Sarissa Precision has started to come in, so I'll need to paint those up. 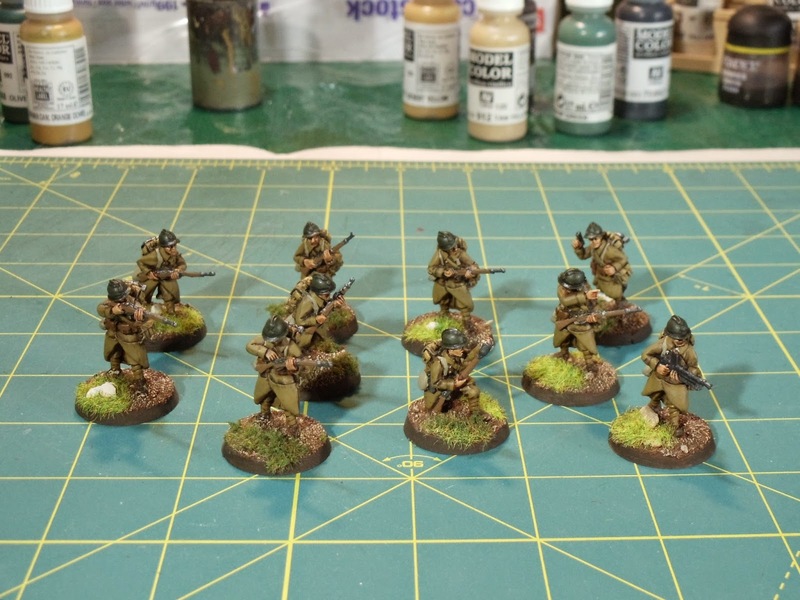 Today I finished another group of World War 2 French. These figures are all Warlord Games. 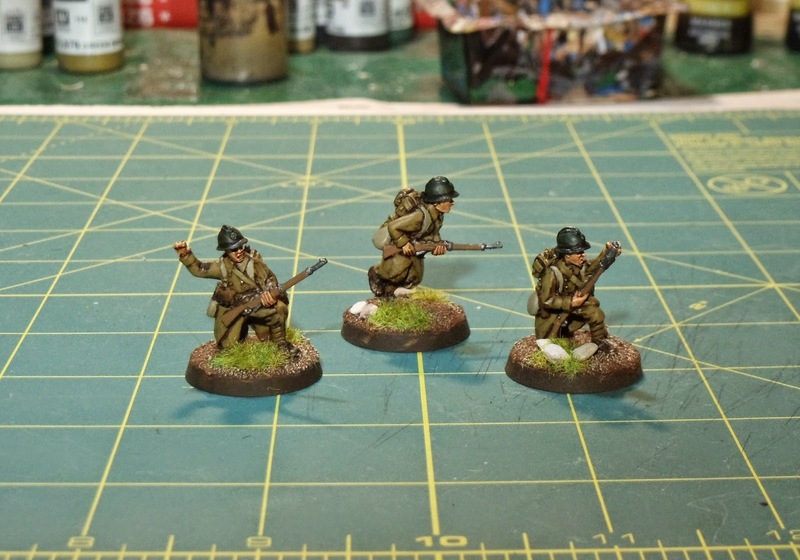 First up is a squad of infantry. Next is an officer and aide. 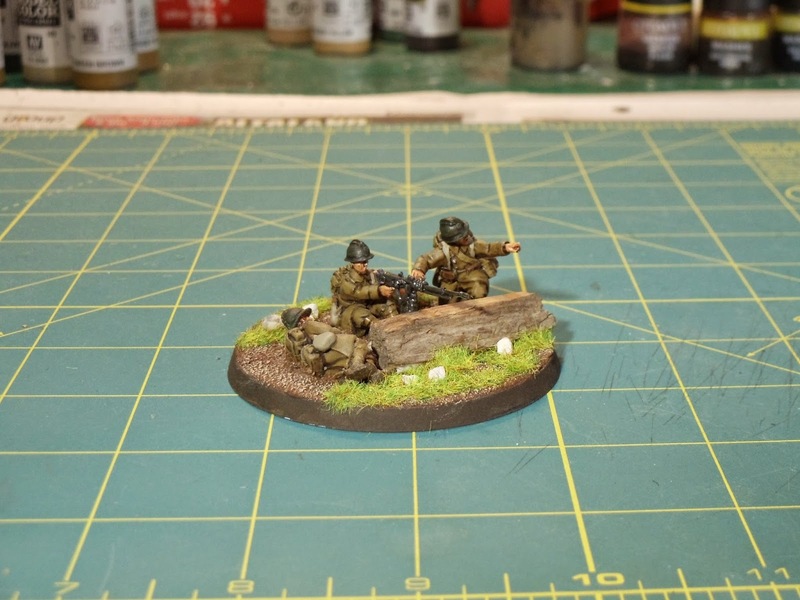 Next up is a medium machine-gun team. 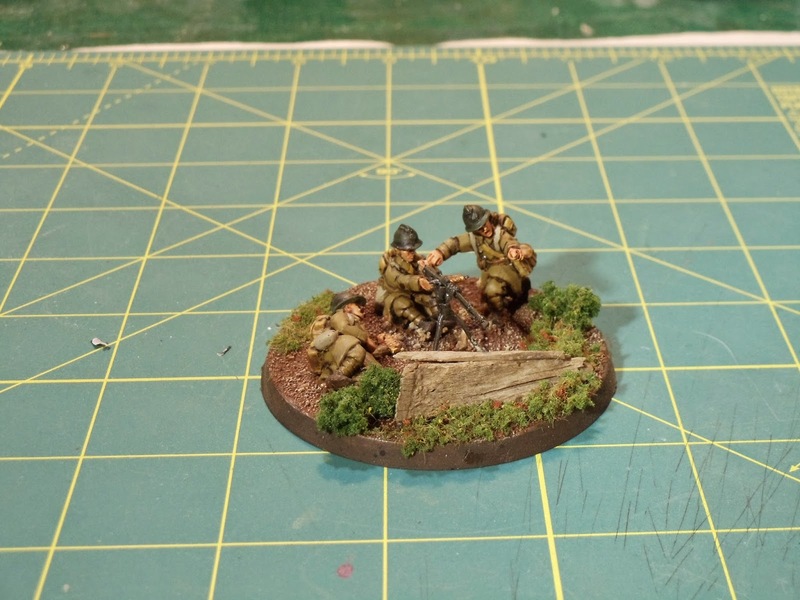 And finally is a mortar team. 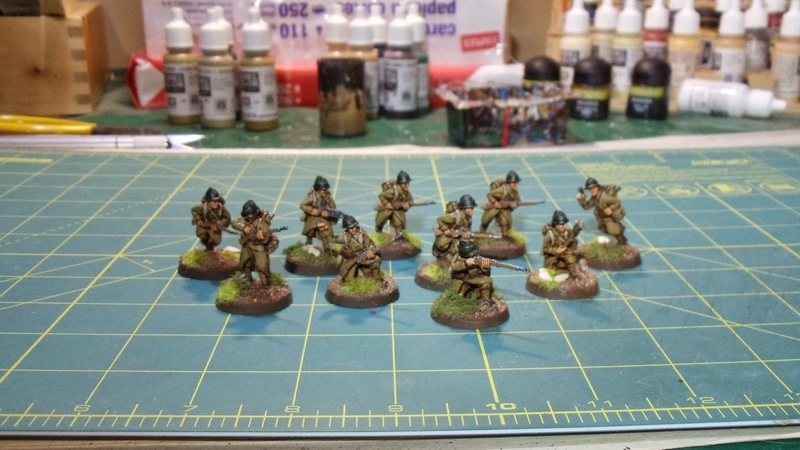 On the paint table is another unit of French infantry and a pair of 75mm guns. 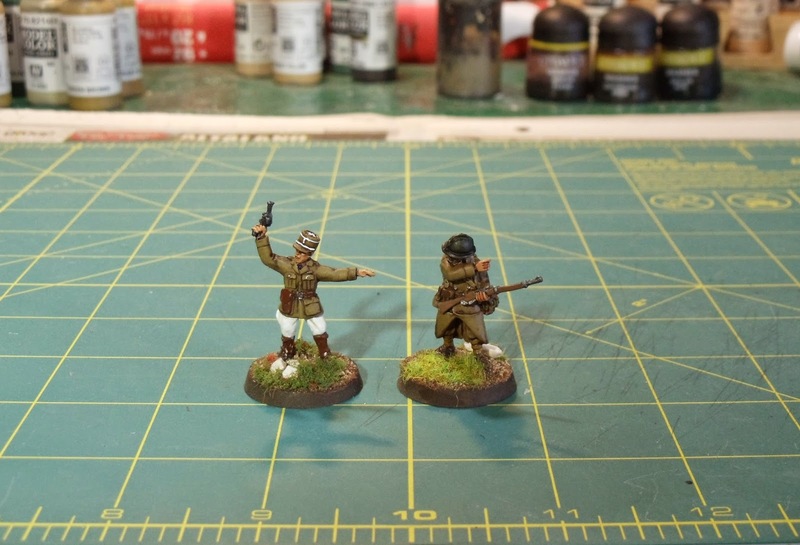 So I decided to jump into a new project, that being 28mm World War 2 French. I figured I'd go early war as that allows more nations with less uber units. Warlord Games recently had an offer of free shipping to Canada and the US, so I figured why not. 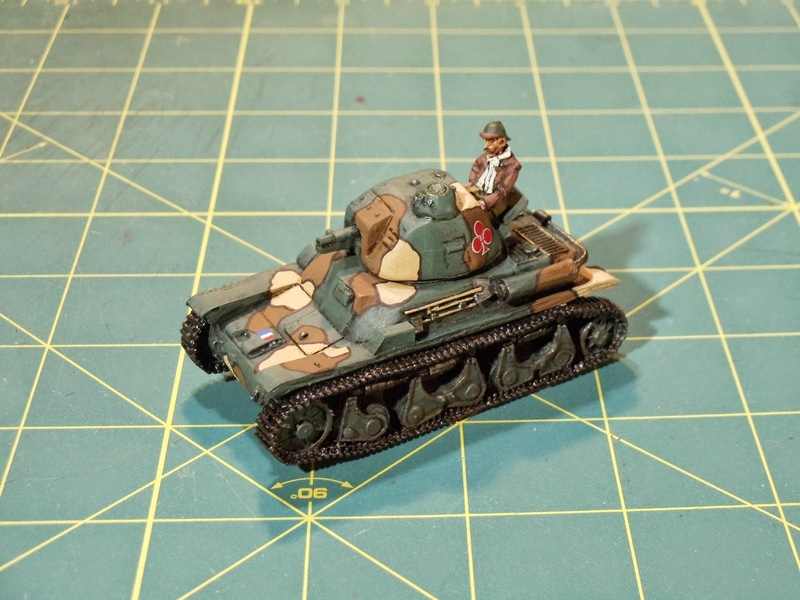 I picked up the 500pt army plus a medium machine-gun and a Renault R35 tank. First up is a squad of infantry. Figures are all metal. 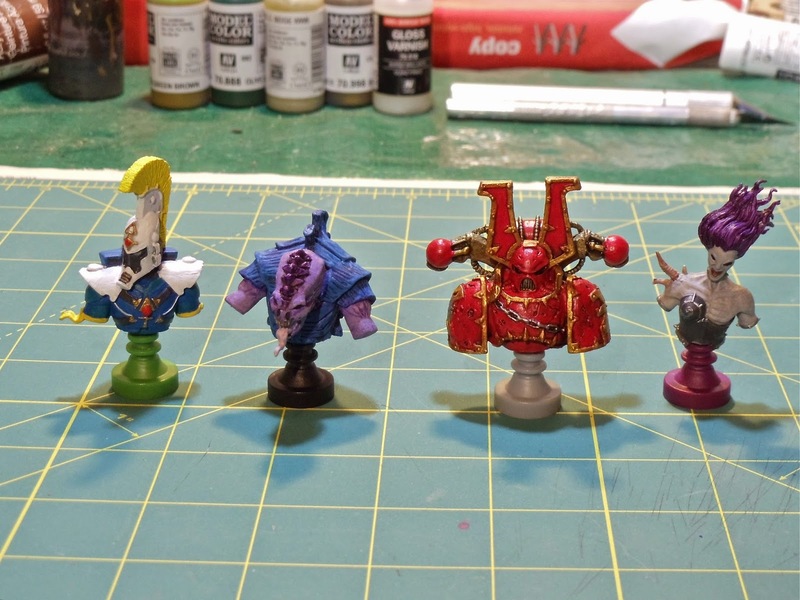 They had very little flash and are nicely detailed. They painted up quite nicely, I was surprised they came together as nice as they did and I really enjoyed painting them. 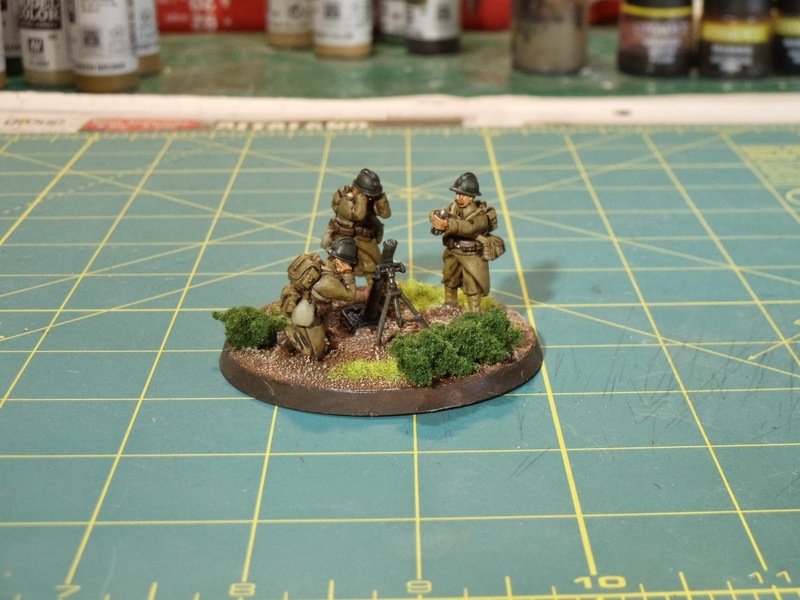 Up next is the machine-gun unit, a mortar unit and an officer and aide. Last November I got in on the Kickstarter for Warfighter by Dan Verssen Games (DVG). Last week it arrived! 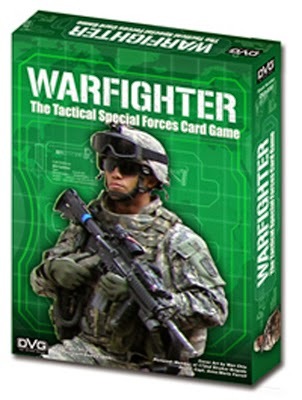 In this game you (and up to 5 other players) assume the role of a U.S. special forces team. Each mission you are assigned a set number of points with which to build your force. Each soldier comes with varying abilities and you then purchase additional skills, equipment and weapons. Each mission has a set number of locations the players have to go to before they reach their objective. And of course along the way there are enemies that need eliminating. The game has two theatres of operation: jungle fighting against drug cartel forces or in the Middle East fighting against either insurgents or organized military units. They game components are pretty nice and come with some novelty items. The dice are in the form of 6 and 10 sided bullets. There's also some 1/72 scale figures to use for each player. I'm not a big fan of the figures so I've ordered some 28mm figures as replacement. I've already had two games and it's pretty slick. This is my second DVG game and it's pretty good. I've been cleaning off bits of projects that have been sitting on my desk for a while and I've finished up these three things this weekend. 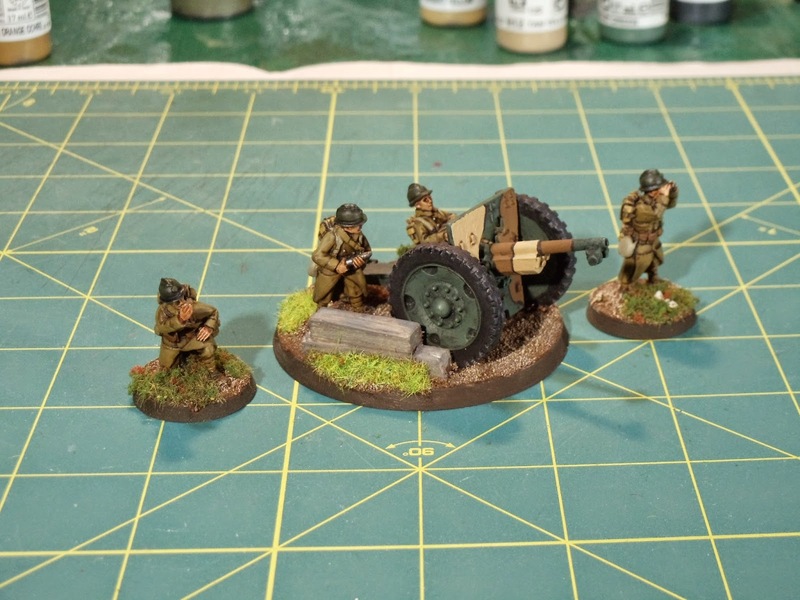 First up is a unit of 54mm British artillery with a light cannon. Figures are from All The Kings Men. 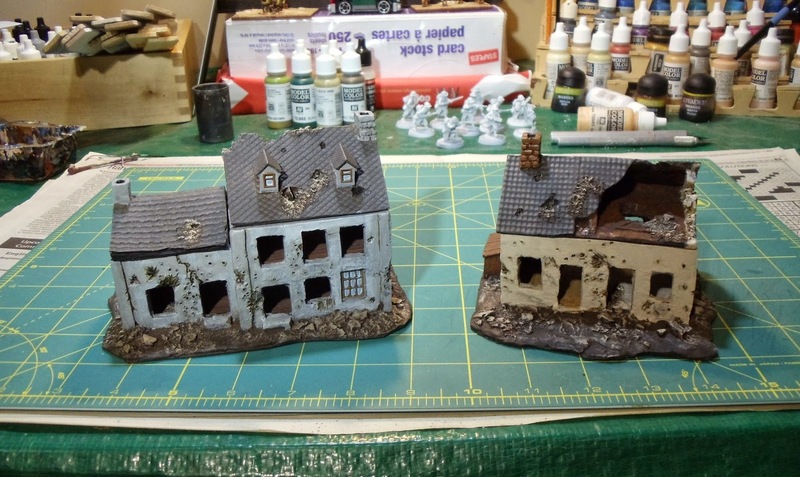 Next is a pair of 15mm ruined buildings from Novus Design Studios. As you can see the roofs come off and I should be able to put a unit of infantry inside. The buildings are resin and come unpainted. Finally I've got a group of four 15mm Hittite chariots completed that have been sitting on my desk from months. Figures are from Old Glory 15s. Sitting on my paint table is another pair of ruined buildings from Novus, a bridge from JR Miniatures (I think). I've also decided to leap into 28mm World War 2 and picked up a 500 point French Army from Warlord Games. So I've got a unit of infantry also sitting on my desk waiting to be painted. As I look out my window I can see snow starting to fall, so maybe this week I'll spend assembling various miniatures (more French, more tripods) for priming before it gets too cold. 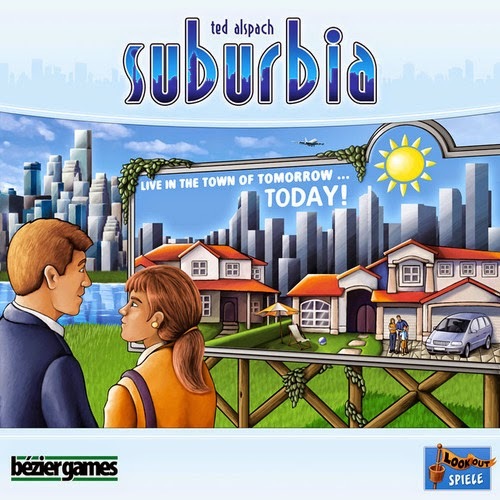 One of the games I picked up last weekend at Fallcon (more on that below) was Suburbia by Bezier Games. 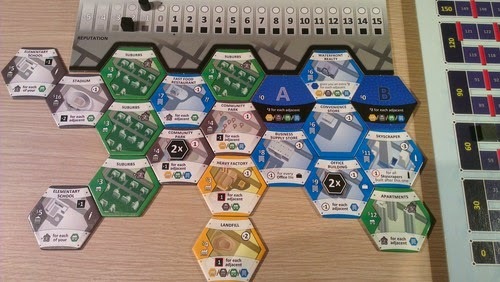 In this game you build a city by purchasing tiles and placing them in the best place possible to maximize your money and reputation you receive. Each tile has certain abilities that can affect the score depending or whether they're adjacent to or near to certain other tiles. The game components are really nice and are of high quality. I've only played a two-player game so far and it took us about an hour. Replayability is quite high so I look forward to playing it again. Last weekend I went down to Calgary and attended my first Fallcon. I had a great time and participated in a number of rather enjoyable games. 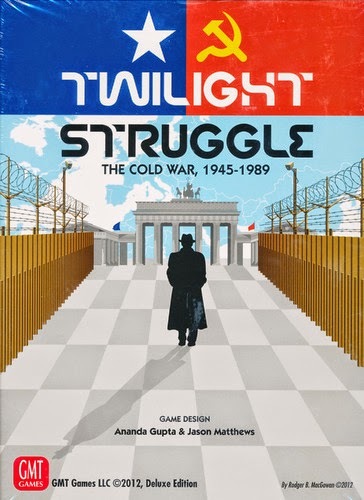 I played in a game of Twilight Struggle against someone other than my usual opponent and proceeded to get beat rather solidly. The game went the full 10 turns but it was a wonder that I held off defeat that long. I also played in a couple new games: Amerigo and Concordia. Both were enjoyable games and I would gladly play them again. 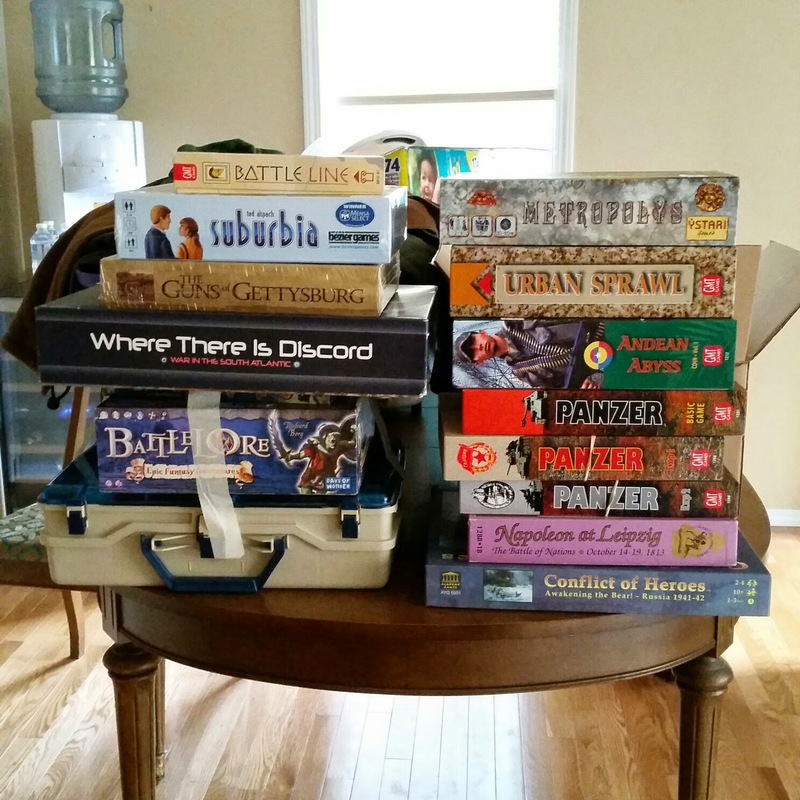 I picked up Guns of Gettysburg from the Sentry Box, I purchased Suburbia from one of the vendors at Fallcon and the rest were either purchased in the auction or flea market. The real gem of the lot is Where There is Discord, a solitaire game about the Falkland Islands War. I'm looking forward to getting this one on the table. 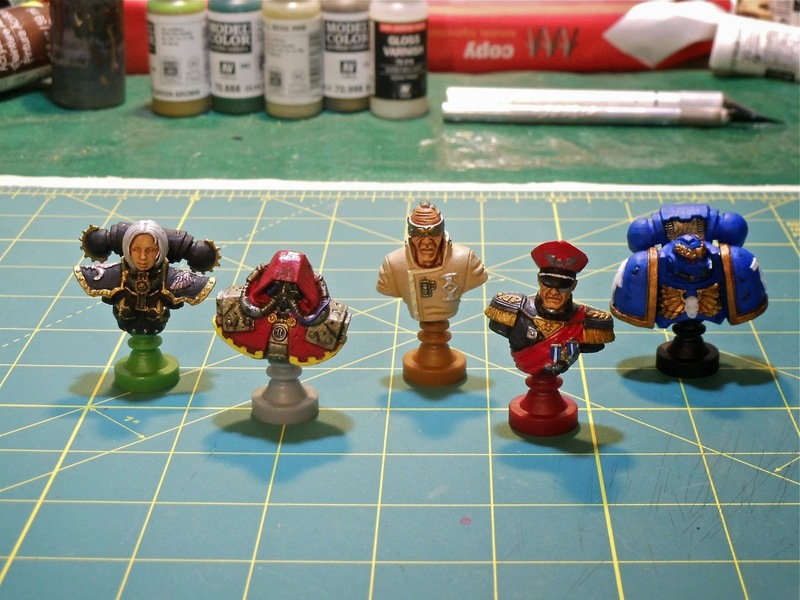 Last night I finished off 12 bases (4 units) of Martain Lobototons with blasters. 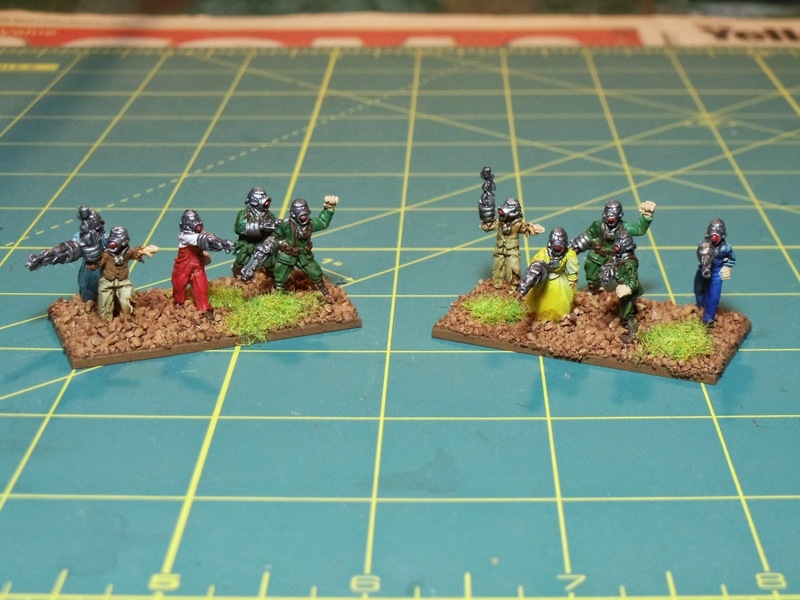 The 15mm figures are the Martian ranged infantry for All Quiet on the Martian Front. 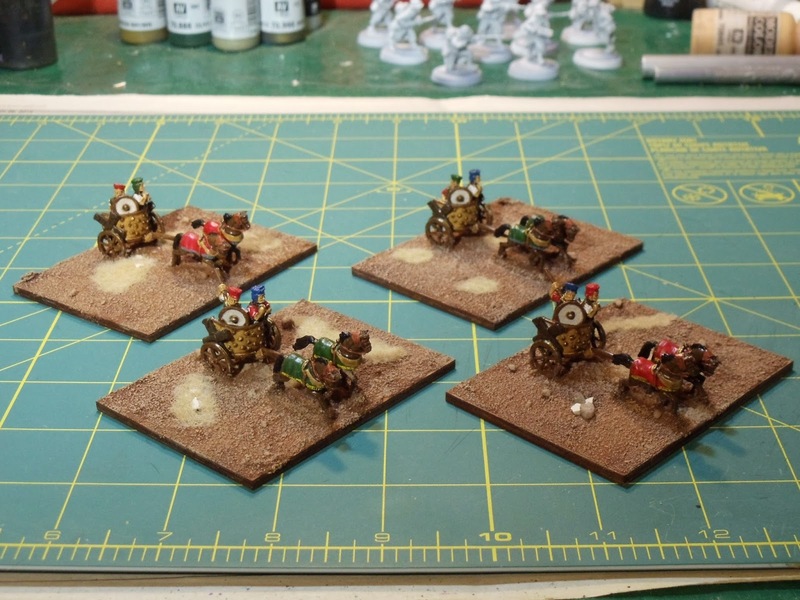 Next up is hopefully some Hittite chariots and a unit of British light artillery for my War of 1812 project. But first, off to Fallcon tomorrow! Been a while since I've posted anything. I haven't done much painting lately but tonight I finally finished a small project. I recently purchased Fantasy Flight Games' Relic and it's expansion Nemesis. This game uses the Talisman game engine and is set in the Warhamemr 40K universe. 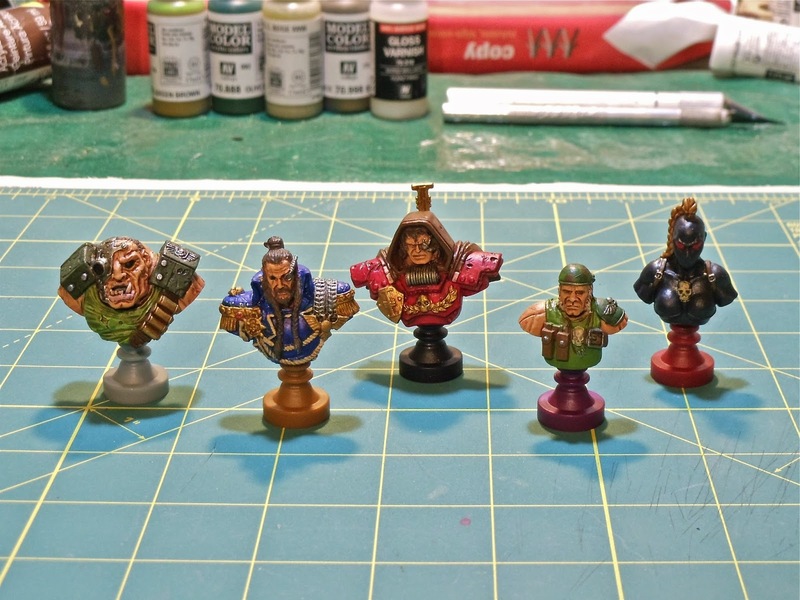 The game comes with some good little character busts that are just asking to be painted. Tonight I finished the last of them. The sculpts overall are pretty good with the Champion of Slaanesh being the weakest (my crappy paint job on that one doesn't help any). I also stuck magnets in the base of the figures so there easy to take on and off the little stand. Sitting on my paint table right now is a horde of Martian Lobototons so hopefully I can get them done in the next couple weeks. 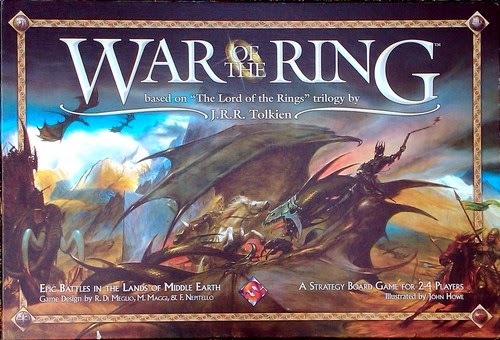 Recently I got in a couple games of War of the Ring 1st edition by Fantasy Flight Games. I picked this up at the MayDay auction last year I think (or was it the year before?) for if I remember correctly, $12. What a great game! 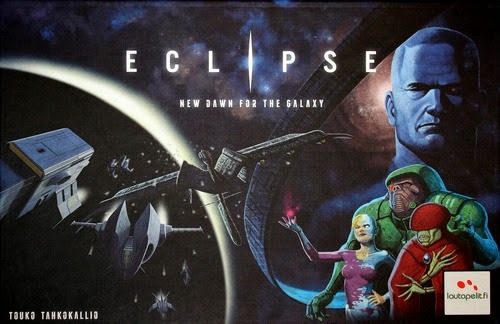 In this game one player plays Sauron and all the forces of the evil and the other plays the Free Peoples. The object being either to conquer Middle Earth or chuck the Ring into Mount Doom (for the Free Peoples) or completely corrupt the ring bearers (for Sauron). Each sides actions are carried out by rolling action dice to determine which actions are available to you. Further play options are carried out by playing character or strategy cards. There's plenty to do and it's not just a matter of move army here, squash these guys and you're done. Do the Free Peoples player move the Fellowship closer to Mordor or do they try and push Rohan into declaring war on Sauron? Does Sauron mass his forces for a couple big hits on Minas Tirith or does he devote more resources to look for the Fellowship? 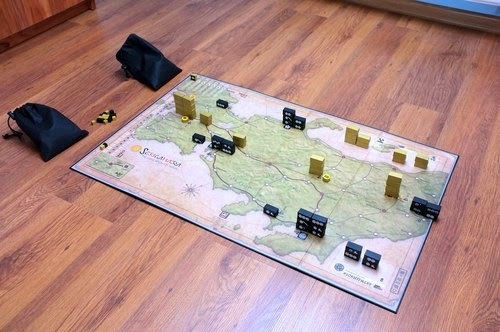 The board itself is really big, second only to my Napoleon's Triumph board. The figures for each side are really nice. The only complaint I had is from my opponent and he wishes each nation was a different colour so it's easier to distinguish the various nations. The rest of the components are typical FFG quality - really good. It took us about 4 hours for our first game and 2 hours for our second. The game can take 3 or 4 players, but its really a 2 player game. I think with 3 or 4 it would be rather boring and just wouldn't feel the same. Evidently FFG doesn't make it any more which is a shame as it's really a great game and I definitely recommend it. 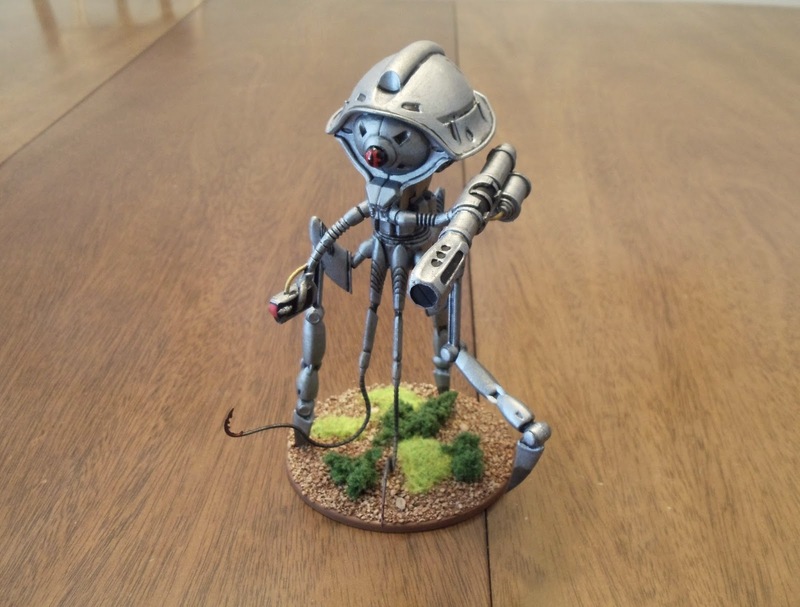 Last night I finished off another group of tripods for my All Quiet on the Martian Front force. 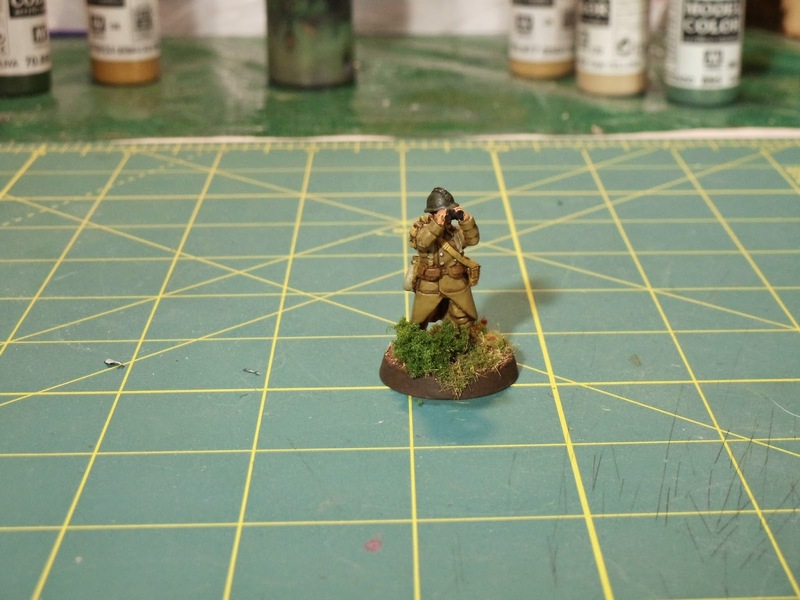 First up is a lone Scout Tripod. 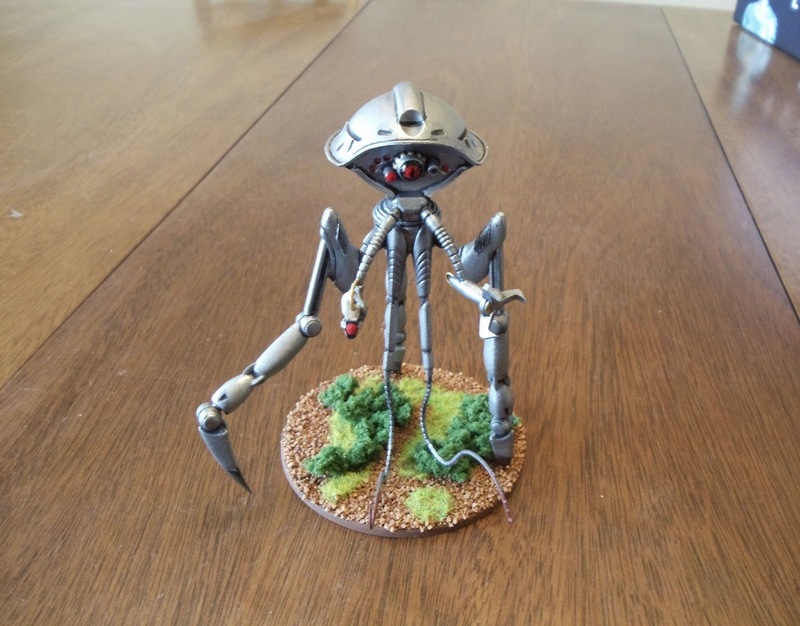 This is a plastic figure that uses the same leg assembly as the Assault tripods. 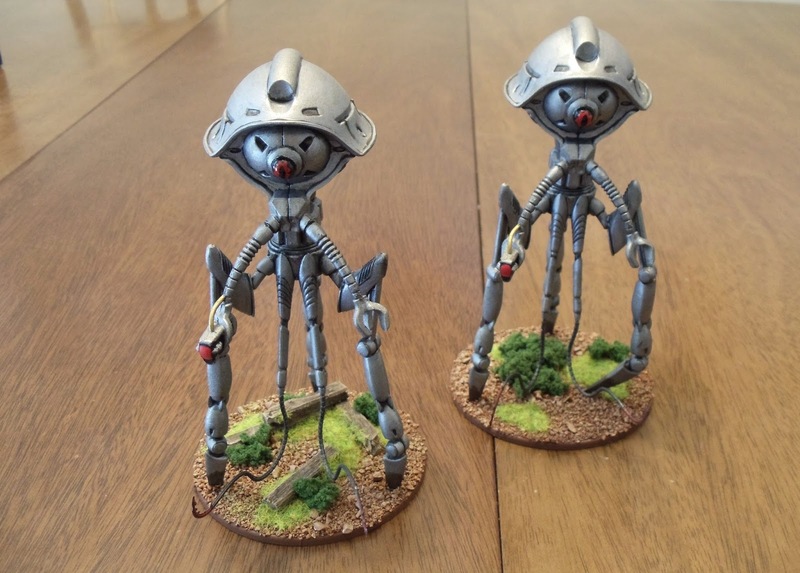 Next up is a pair of all metal Grenadier tripods. I now easily have over a 1000 points of Martians ready to combat the Human hordes. "A monstrous tripod, higher than many houses, striding over the young pine trees, and smashing them aside in its career; a walking engine of glittering metal, striding now across the heather; articulate ropes of steel dangling from it, and the clattering tumult of its passage mingling with the riot of the thunder." 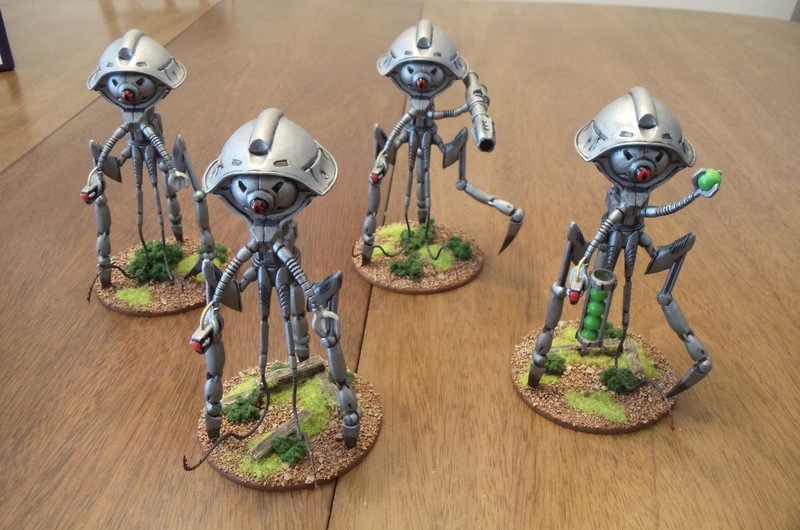 Today I finished a group of 4 assault tripods. 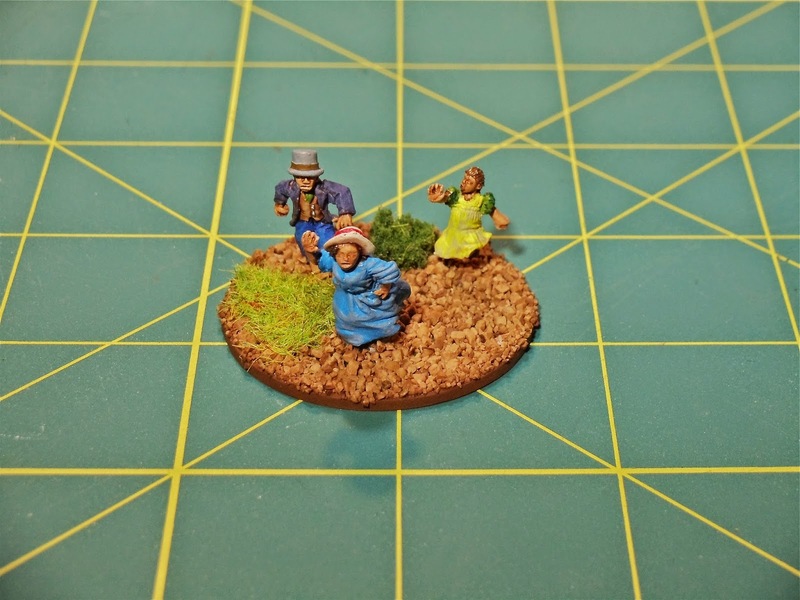 These are 15mm figures, although I suppose they could be used at any scale. Figures are all plastic. 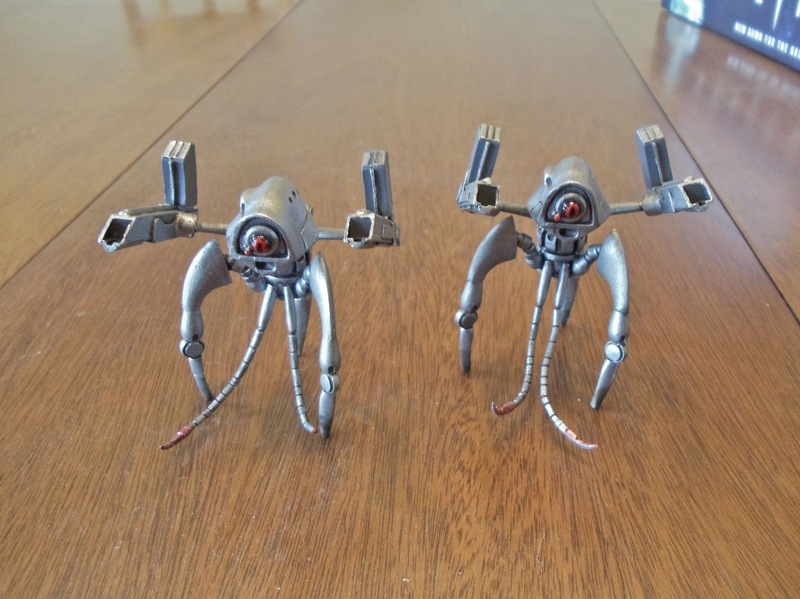 First is a pair of standard assault tripods. Next is a assault tripod with black dust launcher. Finally is an assault tripod with green gas grenades. 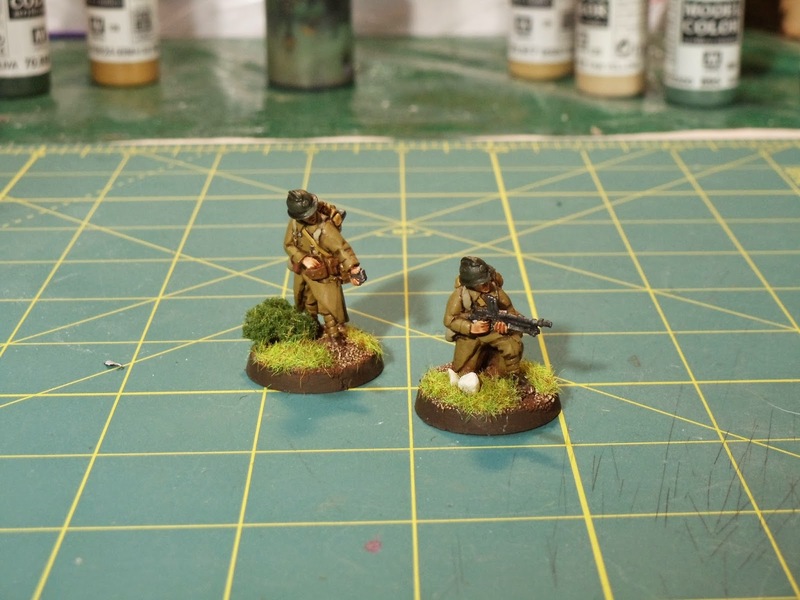 Next on my paint table is a scout tripod and a pair of grenadier tripods. 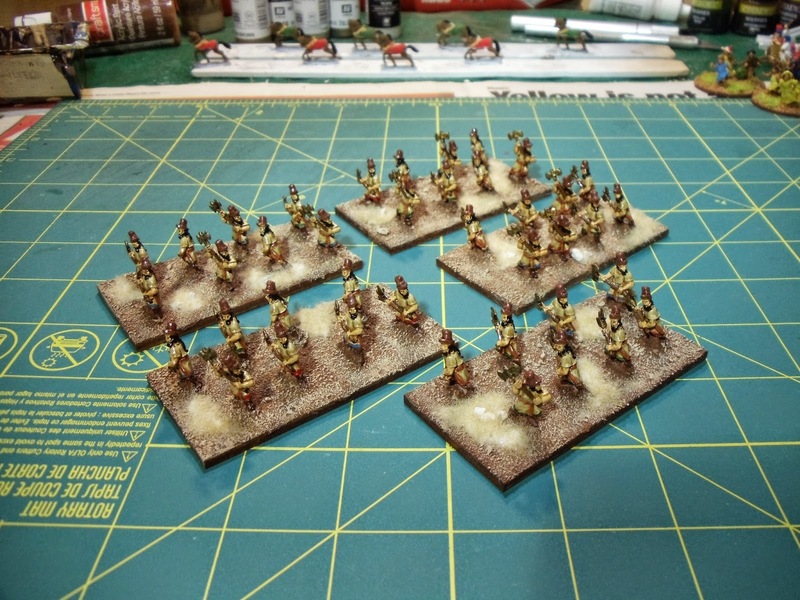 I also have a pile of 15mm Hittites that have to get finished. 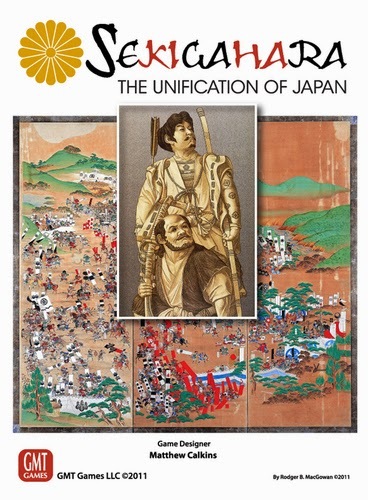 I popped down to the Sentry Box yesterday to do a little shopping and one of the things I picked up was a copy of GMT's Sekigahara: The Unification of Japan. This is a reasonably simple wargame covering the 7 week campaign between Tokugawa Ieyasu and Ishida Mitsunari that culminated in the battle of Sekigahara on October 21, 1600. I was luckily able to actually get a game in last night. In the game you move your armies of blocks around in an effort to kill your opponents main daimyo or at the very least occupy important castles and resource points. There are no dice (yay!) so each battle is fought by playing cards to deploy your troops that you actually brought to the battle. The blocks and cards for each side are divided into the various clans that took part in the campaign. And then there's 'loyalty' cards that you can play to cause a certain number of one clan's forces to switch sides. The game components are typical GMT high quality components. Our first game took about 3 hours to play. It's going to take a couple more plays to really get all the nuances of movement and combat down. There's not a lot of games that cover this period of Japan's history but I'd recommend this one especially if you're looking for an introductory game. Recently I've introduced my best friend to GMT's Twilight Struggle. It's a toss up between whether this is my favourite game or if Commands and Colors is. As there is very little dice rolling in this game, it's probably this one. 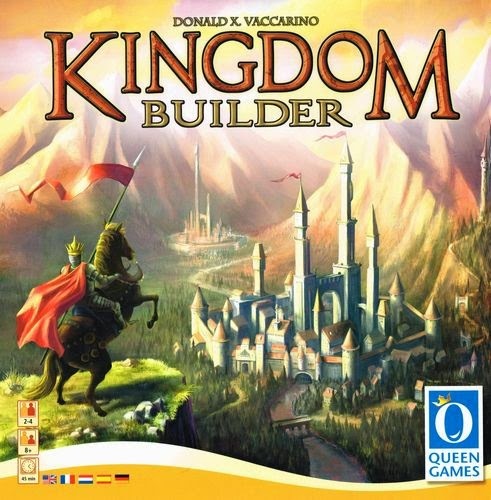 A couple weeks ago I picked up Kingdom Builder from Queen Games. In this game you have a number of settlements that you have to place on a randomly selected board. The goal is to have the most gold at the end of the game. To achieve this, there is a trio of goals that are randomly selected at the start. These goals define how you can make gold. Whether it's have a number of settlements in a row or have the biggest cluster of settlements, each game is completely different. You place your settlements in locations as defined by a terrain card that you get every turn. There is also specific structures that you can place your settlements besides to give you bonuses. For example if you build a settlement beside a henge, you take the henge tile and can now build an additional settlement on a piece of terrain that's the same as your terrain card. The components are really nice, the rules are simple and layed out nicely. You can play a game in anywhere from 30-45 minutes depending on how many players are playing. My friend also picked up a couple games at Mission Fun & Games yesterday and we tried those out . First is The Walking Dead from Z-Man games. 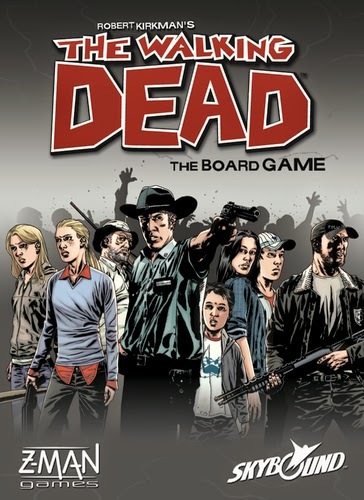 We had played the Walkind Dead Board Game from Cryptozoic Entertainment and we hoped this game was much better. Don't get the Cryptozoic game (which is based on the show), as it's really bad and is a lesson in futility. This version is based on the comic book and is considerably better. The goal is to scout 3 locations. Sounds easy. As you move around, you go to locations to acquire gas, food and ammo. When you get to these locations you have encounters. Encounters can be anything from fighting zombies to rolling to see if you find food. There's tons of encounters so it isn't super repetitive. The only downside is some of the encounters are not very clear what you have to do. The zombies don't roam the board, they slowly build up wherever you moved from so eventually they can become a problem. The components are pretty decent and the graphics are right from the comic. This game can be played in about an hour. And don't get the Cryptzoic version, it really is a piece is sh*t.
The second game my friend picked up was Lords of Waterdeep from Wizards of the Coast. He had played the iPad version and was intrigued by it's worker placement mechanic. 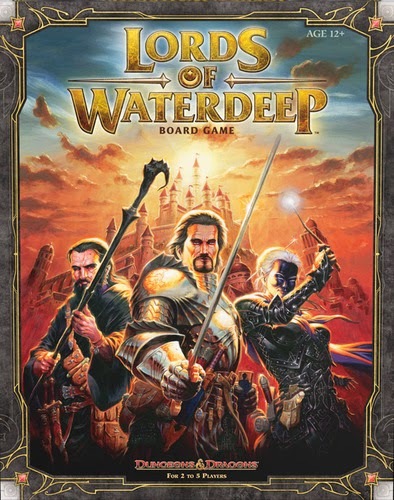 In this game you are a lord in the city of Waterdeep. Your goal is to acquire adventurers to complete quests for you. You start the game with a number of meeple 'agents'. You place these agents in various locations throughout the city to acquire adventurers, new quests, gold, construct buildings and acquire Intrigue cards. Each quest requires a number of adventurers and/or gold to complete. Adventurers come in 4 flavours: clerics, fighters, wizards and rogues. When you complete a quest you get a number of victory points and maybe some other benefit. When you construct buildings, anybody can use the building but the owner receives a slight payoff when someone does use it. The Intrigue cards give you a number of ways to acquire more resources or gold, but their main use is to attack other players. When you pull the game out of the box there's lots of pieces and it may look as if it's reasonably complicated but on the contrary, it's ridiculously easy. The components are pretty good although the cards could probably be a thicker card stock. We played with only 2 players but it can be played with up to 5 players. With only 2 players we didn't have too much of a problem with meeple placement. I can see how a 4-5 player game would be very tense as players vie for the few spots available. The game as it was our first time probably took roughly an hour and a half. I mentioned the quality of the card stock above. 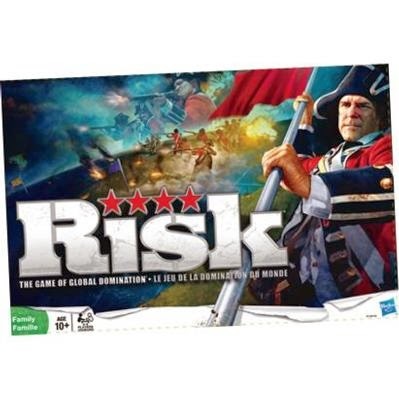 My friend also had picked up Risk from Hasbro (owner of Wizards of the Coast), pictured below. The quality of the cards was really not very good and the figures for you troops were really tiny. The board was nice but the rest was rather poor. Hasbro could learn a lesson or two from Fantasy Flight on quality of game components.